The California Senate passed Senate Bill 54 on Monday, barring state and local law enforcement agencies from using their resources to help federal immigration authorities. Senate Bill 54, also known as the "sanctuary state" bill, passed the Senate in a 27-12 vote, CNN reported. "Our precious local law enforcement resources will be squandered if police are pulled from their duties to arrest otherwise law-abiding maids, busboys, labors, mothers and fathers," Senate President Pro Tem Kevin de León, who authored the bill, said in a statement. De León claimed the bill is "a rejection of President Trump's false and cynical portrayal of undocumented residents as a lawless community." The "sanctuary state" bill prohibits state and local law enforcement agencies from using their resources to cooperate with the federal immigration authorities. Resources include money, facility, property, equipment or personnel from state and local law enforcement. According to CNN, "They would be prohibited from asking about immigration status, giving federal immigration authorities access to interview a person in custody or assisting them in immigration enforcement." 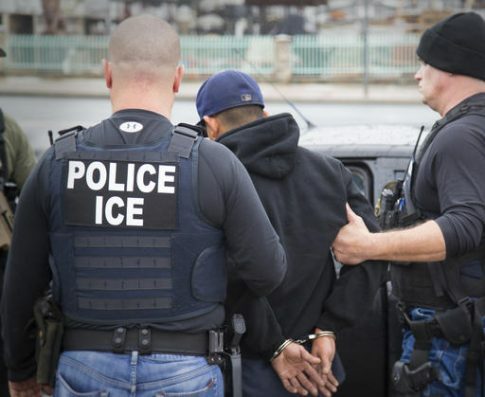 The bill has its exceptions, allowing law enforcement to turn undocumented immigrants over to federal immigration enforcement if they have been charged with a violent felony or have a judicial warrant. But those who oppose the bill point out these felonies do not include human trafficking, child abuse or assault with a deadly weapon. Senate Bill 54 will head to the California State Assembly, where Democrats hold a majority. If passed, the bill will be handed to Democratic Governor Jerry Brown. In late March, the Department of Homeland Security added the entire states California and Connecticut to its list of U.S. jurisdictions that obstruct Immigration and Customs Enforcement in their duties. They are the only two states listed alongside the counties and cities from other states. This entry was posted in Politics and tagged California, Donald Trump, Illegal Immigration, Immigration, Immigration Reform. Bookmark the permalink.